This spectacular split bedroom design blends the warmth of country with classic southern tradition in a detailed porch with round columns on stone pillars. The spacious great room has a built-in media center, fireplace and wall of windows leading to a breakfast room/kitchen combination sharing a handy breakfast bar. 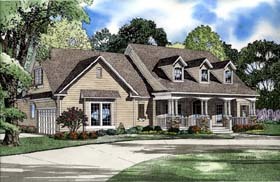 The large master suite accesses a column lined rear porch and has a private bathroom featuring a corner whirlpool tub, makeup area and large walk-in closet. Three additional bedrooms with two shared bathrooms complete the main level. Upstairs you?ll find several bonus rooms with creative ceilings and dormer windows.